Note: I first wrote this post in 2008. I’ve made it a tradition to re-post this entry every Memorial Day, which is observed in the United States on the last Monday of May. The feelings, the emotions, are just as real today as they were then. Plus it seems that everyday I am reminded that This War Goes On. In the past weeks, militant Islamist groups have kidnapped 200 schoolgirls in Nigeria and continue to attack civilians and other non-combatants a suicide bomber killed over 20 people, including children, at a concert in Manchester England and ISIS militants killed a busload of Christians in Egypt. groups such as Boko Haram, Daesh/Islamic State, and the Taliban continue to kill, injure, and attack churches, markets, and those who stand for good. Who will stand up? Who will make a move? Who will say that this can not go on any longer? We had a memorial service this week. Seven warriors had lost their lives in service to our country, in service to you. The cowards we are fighting had set an ambush for our warriors. The cowards can’t meet us face-to-face on the battlefield like men, they use use devious ways to inflict harm and fear. They are desperate, using children and women with bombs strapped to them so that they can stand back and detonate them remotely from a safe distance. Our formation stood in the rain, stoic and soundless, in honor of our fallen comrades and true warriors. Their brothers-in-arms described them to the assembled task force: sons, fathers, brothers… funny, devoted, skilled… loved, respected, missed. Our enemy does not simply threaten our lives–our enemy is at war with our entire way of life. He does not fight for land, or for honor, or for justice or retribution, he only fights to see us dead and our way of life destroyed. He will not negotiate, he will not capitulate, he will not reason with us. It is not sufficient to simply defend ourselves, though we must. Our enemy will only stop when we go on the offense, we take action, and destroy him before he can attack us. 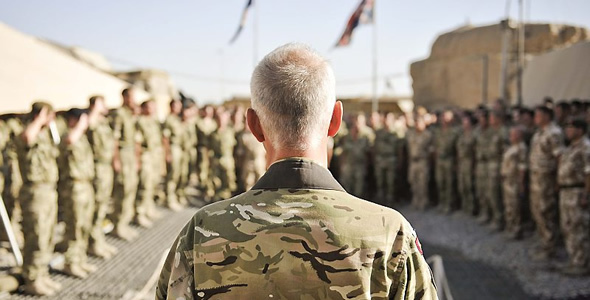 The chaplain then went on to reassure the assembled formation that we do have a calling and hope that is greater than ourselves, we act in the knowledge that the daily, physical battle we face in Iraq is not the greatest battle. I thanked God that we live in a Christian country. There is no better place to understand that than in war, to begin to really value our shared heritage and beliefs. As the old adage goes, ‘there are no atheists in a foxhole’. Take time today and this weekend to honor the fallen, and to commit to not standing idly by when men, women, and children are dying every day. Carry on mighty warrior. The Lord goes before you! Thanks Jim! I’ll take that Word because I’m going through some stressful times right now.